Its your chance to be on TV! Hundreds of Canada's grassroots racers battle for prizes in front of the ALL OUT Live TV cameras. Also Canadian racers take on USA racers that appeared on the TV show Street Outlaws Its a USA vs Canada.. Call Out! 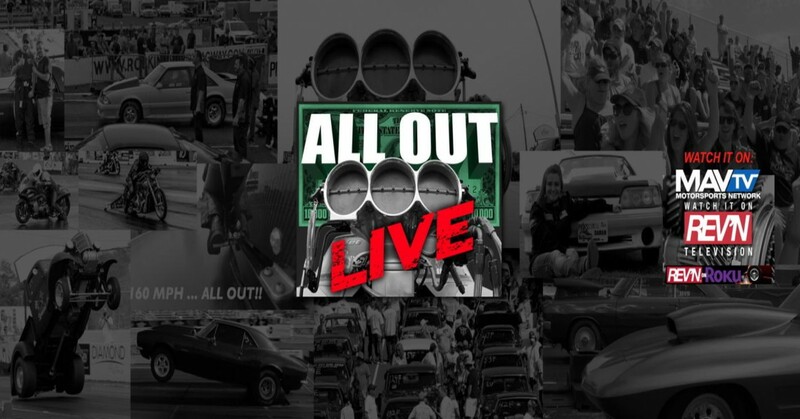 If you liked PINKS ALL OUT® then your going to love ALL OUT Live®. Three shows....One Location, everyone in attendance gets a chance to win Big Cash & Prizes! ALL OUT Racing: With multiple heads up ALL OUT style ET race classes and the addition of motorcycles, there are more chances for racers to compete and win. The CALL OUT®: Race celebrities and top drivers that compete in the NHRA,NMRA,NMCA and the popular TV show Street Outlaws® take on local area racers who think they can beat them.. It's a CALL OUT! INSTANT GREEN®: A fan interactive game show held at every ALL OUT Live. event. Fans from the stands and viewers online can play along with Instant Green host "Rockin Rob" Cherkas for Cash & Prizes!